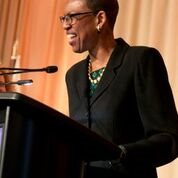 On March 20, CCR received the 2019 Own Award presented by the Girl Scouts of Greater Chicago & Northwest Indiana which recognizes organizations and individuals who have made the world a better place by advancing opportunities for girls and women. Visit their blog for a RECAP of the event! Beginning in 2016, Girl Scouts of Greater Chicago and Northwest Indiana (GCNWI) began a multi-year partnership with the Center for Childhood Resilience (CCR) with the goal of bringing social-emotional learning, development, and trauma-informed care to the GCNWI GirlSpace program. CCR’s partnership with the Girl Scout of GCNWI is focused on providing training, consultation and supported implementation to GirlSpace leaders to further optimize girls’ mental wellness through social-emotional development and trauma-informed education. Outcomes from this partnership, supported by research, have the potential to impact the broader Girl Scout community as well as a wide-range o advocacy and policy reform initiatives.